14 Good Reasons to take a Walk Today. Walking is probably the most ancient exercise option. It’s easy, versatile and beneficial in many different ways. For some people walking is a way to enjoy nature, the sunshine and the outdoors while for others the physical, sporting and fitness aspect is more important. Here are some reasons why you should consider including a walk outdoors into your daily routine. Most of our joint cartilages have no direct blood supply, but get nutrition from the synovial or joint fluid that circulates as we move. The impact that comes from movement, such as walking, brings oxygen and nutrients into the area. If you don’t walk, joints are deprived of life-giving fluid, which can speed deterioration. Recent studies proved that walking for as little as 30 minutes per day lowers blood pressure and reduces the risk of coronary heart disease. Walking every day can also increase aerobic and trunk muscle endurance. Aerobic exercise gets your heart rate up, strengthens your lungs, and improves the use of oxygen throughout your body. Walk with good posture to improve the flow of oxygen into and around your body and take deep breaths. When walking, keep your spine straight, your chest high and your shoulders pulled down away from your ears. 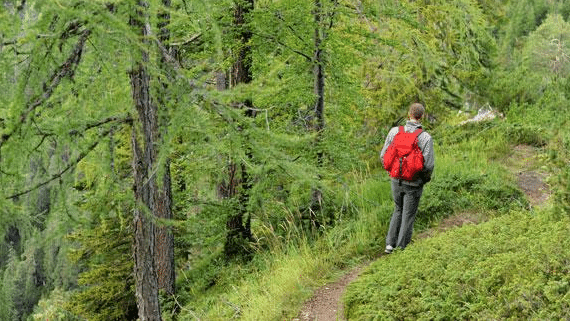 If the extent of your outside time is taking out the trash and walking 10 steps to your car, you have probably gotten far away from the rhythms of nature. You don’t need to get “into the wild”: a simple walk in the park can help you re-establishing that lost connection. It might seem like a paradox, but walking is a nourishing workout. It lubricates your joints and energizes your entire being without overstressing or exhausting it. Head out for a walk at lunchtime instead of sitting in a cafe and see what a difference it makes! Exercise helps strengthen bones at any age, reducing the risks of osteoporosis and preventing osteoarthritis. Walking regularly can significantly improve bone density in the spine and hip, but be careful: if you ever stop exercising, you can quickly lose any gains you’ve made. It has been proven that taking more aerobic exercise, such as walking, can help improve sleep patterns. According to Professor Jim Horne, who runs the Sleep Research Centre at Loughborough University, “brain exercise leading to deeper sleep comes not so much from crosswords or sudoku but from spending a few hours walking in a changing, interesting environment, looking around and absorbing what is going on”. Being physically active has a protective effect on brain function. In fact, regular exercise reduces dementia risk by up to 40 percent! Thinking about problems as you walk can help you work them out. Walking to work helps you get your mind ready for the day while walking back home can help you unwind. Nowadays, you may be spending most of your day staring at a screen. Why not start your own “digital detox”? Learn to cut the cord and take your life back from technology. Getting out of the door for a walk is a perfect way to start. Walking every day can have beneficial effects on your mood, helping you feel much less stressed. How? Walking releases natural pain-­killing endorphins to the body, reducing the physical symptoms and anxiety associated with minor stress. A walking habit can slash your risk of developing type 2 diabetes, asthma and some cancers. A study in the British Medical Journal showed taking more steps every day can help ward off diabetes. Walking daily has also been shown to increase good cholesterol (HDL) and decrease bad cholesterol (LDL). Furthermore, those of us who are active have a 20 percent lower risk of developing cancer of the colon, breast and womb than those least active. Researchers from the University of Essex found that as little as five minutes of a “green activity” such as walking, gardening, cycling or farming can boost self-esteem. All natural environments were beneficial, including parks in towns or cities, but green areas with water appeared to have a more positive effect. Ever considered going for an evening walk at Fitzgerald Park in Cork City? No gym subscription fees, no expensive equipment needed and -obviously- no petrol costs! Walking is 100% free and you don’t need a ticket to get out of the door and start using your own legs.